Why Do Tomato Blooms Dry Up & Fall Off? The tomato is one of America's favorite fruits to grow. 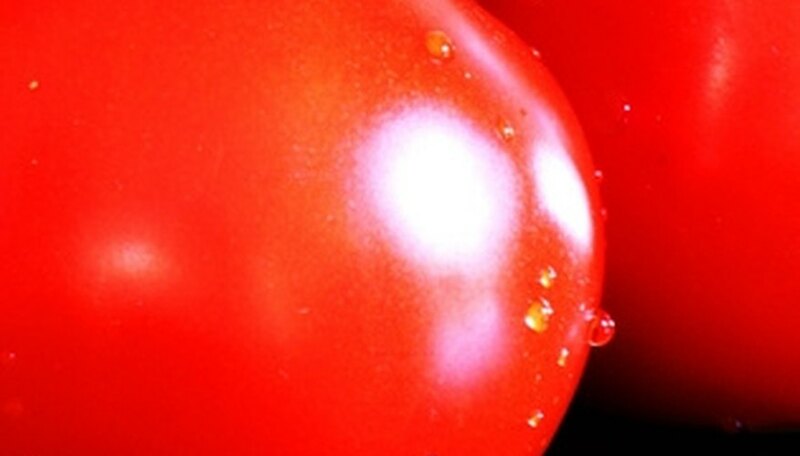 Tomatoes come in a variety of sizes, from the tiny grape tomato to the impressive Beefsteak. A lot of varieties have been bred for specific types of climate. If you aren't careful about which type of tomato you plant in your garden, you could find yourself running into blossom drop. Blossom drop is a condition in which a tomato plant blooms, but the flowers die and fall off without producing any fruit. The main reasons blossoms on a tomato plant dry up and fall off are too much fertilization and adverse weather conditions. According to the University of Nevada, blossom drop is caused by one of the following: too high or too low temperatures, low humidity, producing an unusually large number of fruit, improper watering, and poor fertility practices. Like many plants, tomatoes are sensitive to extreme differences in temperatures.Tomato plants thrive in temperatures between 70 degrees F and 90 degrees F. Tomatoes can only tolerate short term exposure to temperatures above 90 degrees F and below 55 degrees F. If the tomato plant has blossomed and then goes through 4 nights of temperatures below 55 degrees F, the flowers will drop. Night temperatures above 75 degrees F have the same effect on tomato blossoms as well. This is because too much heat at night causes the plant to use up all of the food reserves it produces during the daylight hours. Successful pollination is crucial if a tomato blossom is to produce fruit. If you live in an area that normally has calm summer days without any wind, failure to pollinate may be one of the main culprits of blossom drop. Another cause of failure to pollinate is lack of humidity. Tomato blossoms require that the relative humidity of their environment is somewhere between 40 percent and 70 percent in order for the pistil's stigma to remain sticky enough for pollen to adhere to it and fertilize the flower. In temperatures exceeding 90 degrees F the pollen in the flowers becomes tacky and is rendered non-viable. The horticultural staff at the University of Nevada recommends directing a hard stream of water at the blossoms twice a day during peak hot hours to encourage flower pollination. The water will evaporate quickly in the heat and lower the temperature around the blossom while raising the relative humidity in the air around it. This effectively loosens the pollen and will increase fruit production. Sometimes a young tomato plant produces too many fruits for it to fully sustain. In order to stop more fruits from starting on an already strained plant, the blossoms will wither up and fall off. The best course of action when this occurs is to pick off all currently growing fruit and flower blossoms. Once the fruit and blossoms are removed, the tomato plant will be able to start over again and new blossoms will begin to appear. Over-watering, drought and water stress all contribute to blossom drop. Too little watering as well as over-watering in thick heavy soils that do not drain properly can prevent roots from growing. To prevent this be sure to keep the plant's root zone, which is a depth of 3 to 5 feet, uniformly watered. Make sure that the soil is properly tilled in order to maintain sufficient irrigation of the root system. Garden Web: Why are the blooms on my tomato plant dying and falling off? Tomato Plants: Why do the blooms on my tomato plants dry up and fall off? Why Don't My Tomato Plants Have Blooms?